[DEAL]Save extra $5 by use code TOTO5OFF when check-out. 2018 Sunrise / Sunset Simulation Wake Up Light: 30 minutes before your alarm time, the will be on from 1% of the brightness to 100% at set time to bring you out of deep sleep gently to welcome a refreshed day; And Sunset function will guide you to natural, restful sleep. 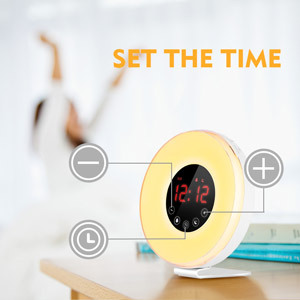 Newest Alarm Clock adds Smart Snooze Function with Touch Control, gently press Snooze button to directly enter the snooze mode, after 5 minutes gently start playing again and last for 2 minutes, easy to operate it! 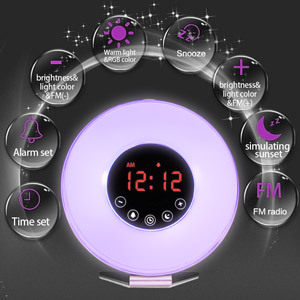 6 Natural Sounds & FM Radio: In order to meet the needs of most of the guests, our this sunrise alarm clock light offers 6 natural sounds (piano, violin, bagpipe, waves, birds and "DiDi" ) which can let you feel the beauty of the nature; Besides, you also could set FM Radio as your the 7th sound. 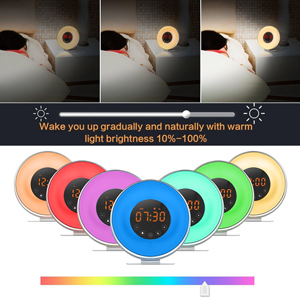 Multiple Colors Nightlight & Atmosphere Lamp: The sunrise light has 7 colors including warm white, green, red, blue, purple, orange and indigo light, or works as warm white LED light with 10 adjustable brightness settings. 3 Charging Ways: Powered by USB Cable and Wall Jack, or use backup 2*AAA batteries(not included) in case of emergency. We suggest that using the batteries and the USB cord together in case of resetting the time when the cord gets disconnected. 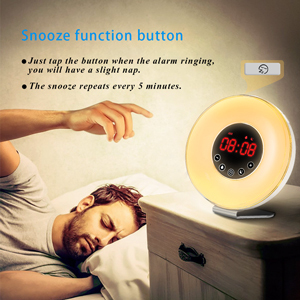 1, Snooze function: Snooze function will give you 5 more minutes' sleep, and play again after 5 minutes and last for 5 minutes, and you can stop the sound by touch any button except “snooze”. 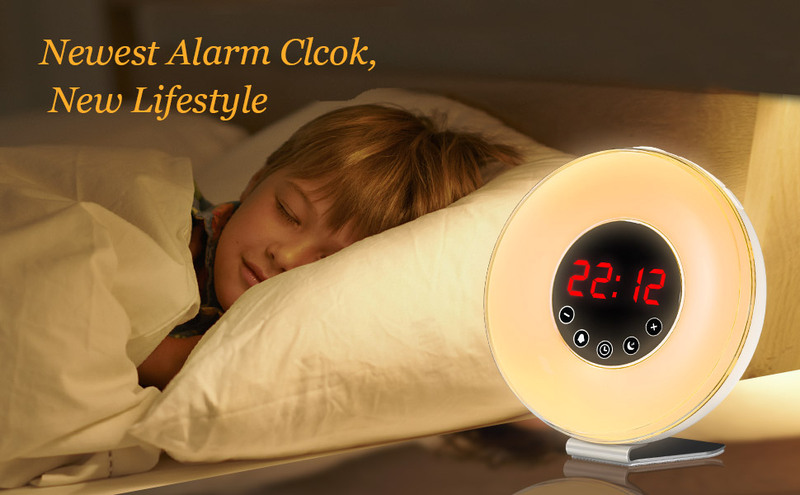 2, The surface of the sunrise alarm clock is made of ABS&Acrylic and is a favorable product, which meets the general needs in your daily. It might be a bit complicated for green hand to set the product. Please operate it with the introduction guide when first use. 3, If you don't want to hear the sounds in the morning, set it to 7, which is the silent option. That way you'll be awoken by the morning light getting progressively brighter until it's at 100%. Besides, the brightness of time display also can be closed with a particular button. When the plug is connected, the hours indication stars to blink. Please touch "+"/"-" to adjust hour, and confirm with ‘Time set button’ which is the first key on the left; Setting minutes "+"/"-" to adjust and confirm ‘Time set key ’If the indication stopped, please touch the first button ‘Time set key’ on the left again, and continue changing the current time. When the sound plays, press “snooze” to get 5 more minutes' sleep. When the alarm sounds again or again, it will last every 5 minutes. 10 adjustable brightness settings as a bedside lamp which will do less harm to your eyes). 7 selecting colors (warm white-green- red- blue- purple-orange-indigo) when used as an atmosphere night light.